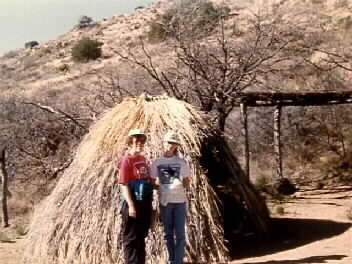 This is an example of the type of dwellings built by the Chiricahua Apache Indians at Fort Bowie. It is called a wickiup by whites, but in Apache it is called gowah. The San Carlos and White Mountain Apaches still frequently build wickiups. My wife and daughter are standing near the gowah.